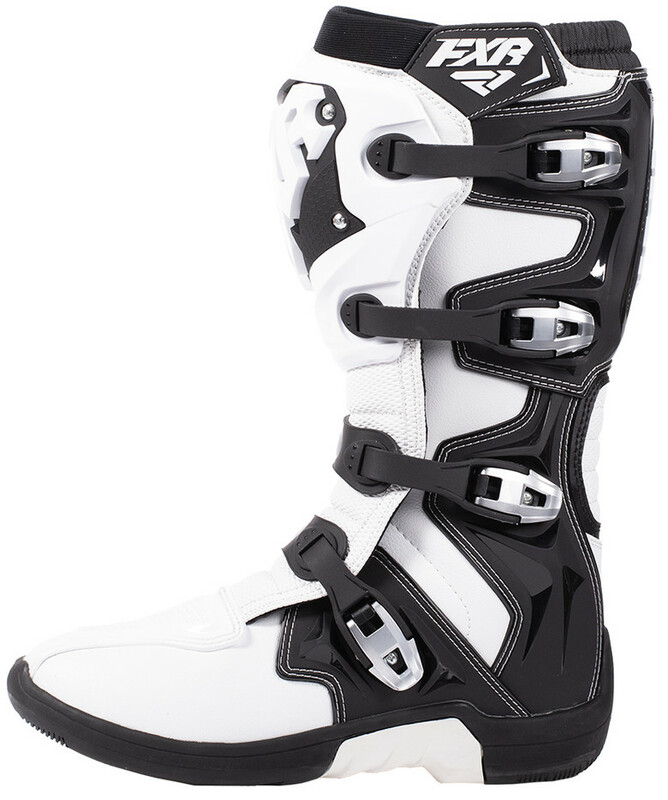 Mid-level motocross boot from the Great White North. 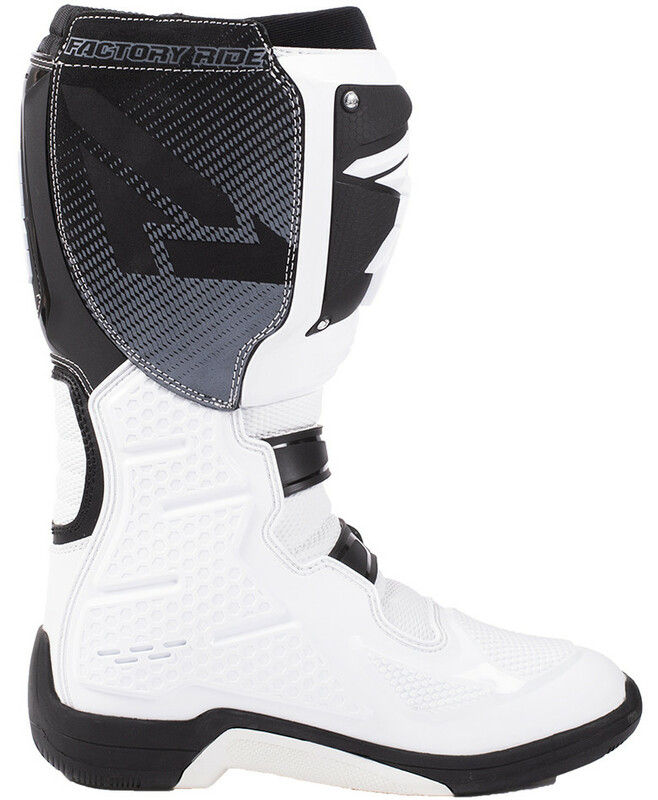 Simplicity and comfort are top priorities for this Factory Ride Boot from FXR. Motocross boots are hard to make. You’d think they are fairly simple because there are a bazillions of shoe companies in the world, but performance off-road foot protection? Not so much. FXR wants to throw its hat in the moto boot world with the Factory Ride Boot. Its price is quite a bit higher than the truly entry level boots offered by other motocross gear brands, but not nearly as wallet-draining as the top-tier boots on the market. We wanted to know a little more about these boots so we grabbed Greg Small from FXR to run us through them. Vital: I’m sure you have your hands your hands full with jerseys, pants, and gloves... Was this boot developed in-house at FXR? Greg: Yep, working with our manufacturers we spent about two years developing the boot. We tested well over 20 different prototypes just trying out different molds, different materials, different foams, as well as trying out different soles. What makes the FXR boot different than other mid-level boots on the market? Well, we wanted to design a “premium entry-level” boot. It’s good for seasoned riders who want to put hours out on the track or in the trails throughout the week and the year. But they want a boot at a value price that isn’t going to break the bank. So our boot has an initial break-in period but then it is going to retain its rigidity throughout the season, it’s not going to go soft. A lot of boots, on the lower end, you can fold them in your hands as you walk out the store and there is not much support at all. But with our boot, it’s going to have the support whether you’re riding at Milestone or going into the High Dez, you’ll be ok.
Talking to the FXR reps at the AIMExpo about the boot, they made a point to say they this is purposely not a hinged boot. Any specific reason for that? We wanted to go with a classic design that kept things affordable for most riders out there. Going without a hinge let us stay at the entry level price point. Is there shank in the sole? No, there is no metal shank in the sole. We use a hard plastic base for the boot. The sole is a dual-density sole that we tested on many occasions. We went with one that is a good balance of durability and feel. In fact we have some local pros that have been putting well over 50 hours in the boot this year, and they are still stiff and supportive. Our conversation was cut a little short by some meetings on both sides, but we are looking to get a pair in our hands to try out soon. What we liked about what we did hear was a focus on the boot not going soft and having fast guys put plenty of hours in the boots without having them fall apart. The negatives that we can see, though, is that the sole is not replaceable and without a shank, there might not be enough support for fast paced motocross and off-road riding. We are happy that the mid-priced boot category is getting a little more crowded since the top level choices just keep getting more and more expensive. While it is good for you and us, it does put a lot of pressure on manufactures to offer legit products since there are more options to compare them to. You might be seeing a mid-level boot shootout just around the corner. What boots do you run? Leave a review in our Product Guide in the Motocross Boots section.